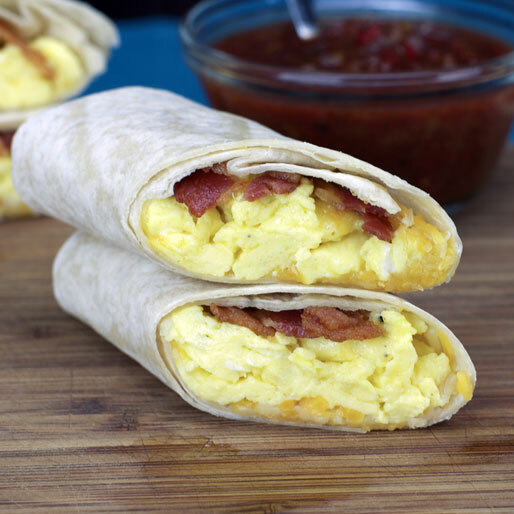 Is a breakfast tortilla wrap the same thing as a breakfast burrito? Pretty much, but not exactly. In a burrito, the tortilla is folded over the filling one time. In a wrap, the side-edges of the tortilla are folded in and then the tortilla is rolled over the ingredients. The difference is far more noticeable when there's less filling. But that's not how I "roll". I like as much egg, bacon and cheese as I can possibly fit. This recipe was submitted by "caroline" back in 2002. It took me a while to try it (November 2012), but I'm glad to report that her recipe is a complete success. I didn't change a thing. What you see in the pictures is her exact recipe. 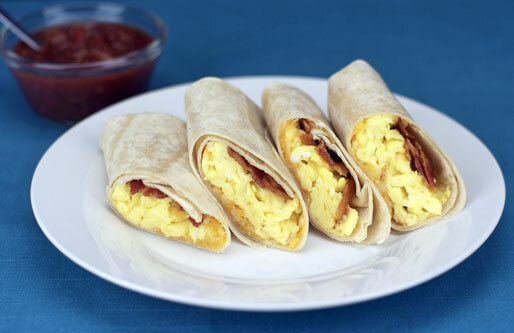 If you're looking for a very basic, no-frills breakfast burrito kind of thing, this is easy to make and it tasted fantastic. In a large pan over medium-high heat, fry the bacon until browned and completely cooked. Transfer to stacked paper towels to remove any excess grease and to crisp as it sets. In a mixing bowl, beat the eggs with the milk and a couple pinches of salt and pepper. On each tortilla, sprinkle 2 Tablespoons of shredded cheese. Cover with 1/3 of the scrambled eggs. Top with 1 or 2 slices of bacon. Fold the tortillas envelope-style or roll it up like a wrap. Let them set 1 minute so the cheese melts. Eat and enjoy! 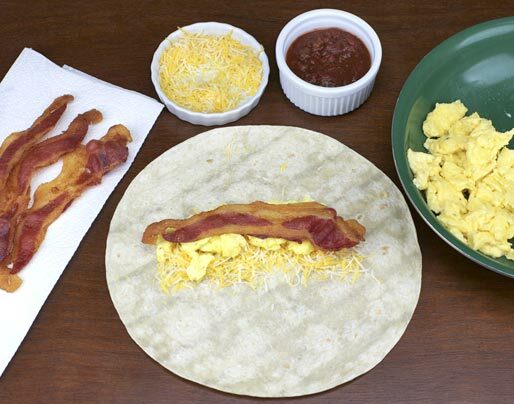 I put out the ingredients (tortillas, scrambled eggs, bacon and cheese) and let each person roll or fold their own wrap or burrito. Fun for a buffet-type breakfast. Recipe number 330. Submitted 7/10/2002.